Takeaway: These three poses provide a great opportunity for you to push your body's balance and learn how to find your drishti and center. Moreover, they give you the chance learn how to pick yourself back up. I love balancing poses. They’ve been an integral part of my daily yoga practice for years. All yoga poses benefit the body and mind, and balancing postures are no exception. They build discipline and focus. They strengthen the nervous system and also our muscles. Balancing poses teach us how to stay centered even in wobbly times. They help ground us, by aligning our own gravitational field with that of Mother Nature’s. They also teach us that it’s totally ok to fall, and then get back up without making a big deal out of it. By practicing balance postures, we learn how to do all of this---on the yoga mat and also in our own lives. Yoga is full of balancing postures to help us learn and grow as yoga students. Some are more popular than others. Let’s take a look at my top 3 balancing poses---poses that help us gain profound yogic wisdom as well as the grace and elegance to navigate life’s turbulent waters. Known as Vrksasana in sanskrit, tree pose is my go-to balancing pose. It doesn’t matter how many years you’ve been practicing yoga---tree pose always challenges us while teaching us important life lessons.In tree pose, we must work on our drishti. Our drishti is our yogic gaze---the point of external focus. In tree pose, we need to focus our gaze on one point directly in front of us. (Learn more about The 9 Drishti of Yoga.) This helps us maintain our balance. Once our eyes start darting about, we tend to lose our balance and fall out of the pose. When this happens, all we need to do is get right back into the posture, without complaining to ourselves or giving up. 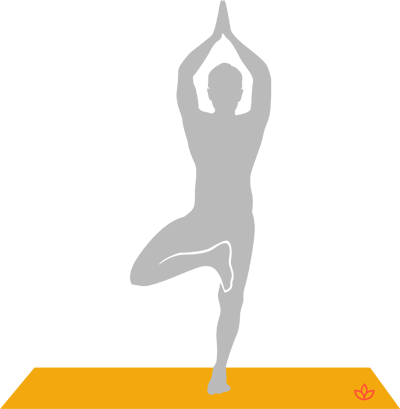 Tree pose can be done at any level---beginner, intermediate, or advanced. We balance on our standing leg and then place the other at our ankle, our calf, or up at our thigh---depending upon our own level of proficiency. Our arms rest at our heart center in prayer pose or we raise them above the head. Our arms provide for variations on the posture, keeping it forever interesting. Once in tree pose, we focus and we balance. We strengthen the standing leg while working on external hip rotation, which cultivates hip flexibility, on the other leg. Tree pose teaches us how to stay the course, even through the sometimes treacherous winds of change. Dancer’s pose (natarajasana in Sanskrit) is more advanced than tree pose, but it feels really good once you get it down. I love the way dancer’s pose makes me feel. It feels like I’m stretching and strengthening almost every part of my body. And, that’s one of the amazing aspects of yoga. It’s a truly holistic practice. In dancer’s pose, we become Shiva, the ‘lord of the dance.’ We focus our drishti in order to balance. We get grounded on our standing leg in order to blossom into the beautiful pose. Dancer’s pose builds strength and elongates muscles. It opens up the chest, shoulders, and arms. It even tones the buttocks. Natarajasana teaches us how to be elegant and graceful when we’re in a state of mental and physical balance, and even when we’re in a state of imbalance. When and if we fall out of the pose, which happens sometimes, we simply step right back in with eloquence. The challenging posture keeps things lighthearted. When we fall, we can laugh at ourselves in a light, loving way. This reminds us not to take ourselves too seriously---an important spiritual teaching to remember. I love dancer’s pose for the challenge and fun it brings. It’s no doubt one of the top balancing poses in my book. 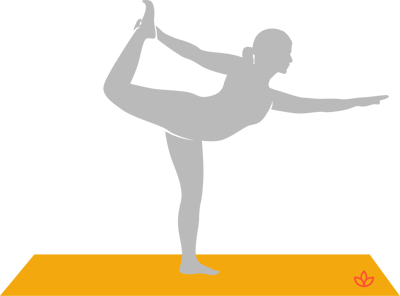 Half moon pose, also called ardha chandrasana, is a mesmerizing yoga pose. In half moon pose, we harness the moon’s lunar energy, and use it to find our balance, inner poise, and strength. Half moon pose is deceptively challenging. It looks relatively simple, but once you actually do the pose, you learn it’s intricacy. For some, half moon pose is one of the most challenging yoga poses, which is what makes it so fun. You never tire of a pose that is forever challenging and helping you grow and evolve as a yogi. In this posture, we also have to use our drishti to help us balance. The drishti can be focused down at the standing foot or up at the outstretched arm. Variations in drishti help keep things interesting. 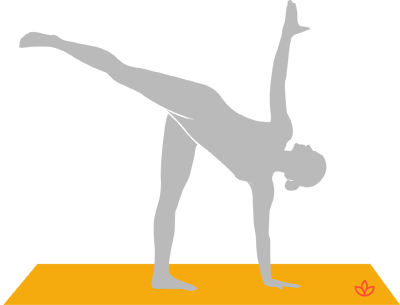 Have fun with half moon pose and don’t flip out when you fall out of the pose because you inevitably will at some point! Half moon, like all balancing postures, helps us cultivate strength, flexibility, and stability---both in our bodies and minds. Balancing poses teach us how to stay the course, even when things get difficult. Balancing poses are great teachers---for life both on and off the mat!